Building the railroad that Went to Sea with photos. 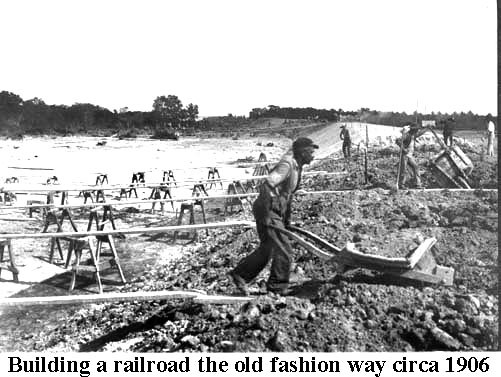 Preparing the railbed in the hammock area was similar to the process on the mainland, until soil had to be moved. There was no soil, except for a few inches of leaf mold and it was only found in depressions. Hurricanes had kept all except the higher areas washed fairly clean. Work was very labor intensive and usually done with manpower using wheelbarrows and mule drawn carts. Dynamite was probably the most effective tool. Practically every sizable island had a drill crew to make holes for dynamite charges. See web page on work crews. Trees and shrubs were cleared with hand tools, usually the ax for trees and dynamite for the stumps. It is clearly seen why Henry Flagler had as many as 5,000 workers at any one time. This scene is being repeated throughout the Keys. Note: I am using Upper Keys photographs as they are the ones I obtained from the Krome family and are dated by engineer W. J. Krome. As a historian, I believe that dates are important to establish sequence of events. J.W. One has to imagine the amount of work to excavate the above quantity of rock. Especially, any one that has ever planted shrub in the Keys, and chances are they did so in fill. This is solid cap rock. The operative word is dynamite. 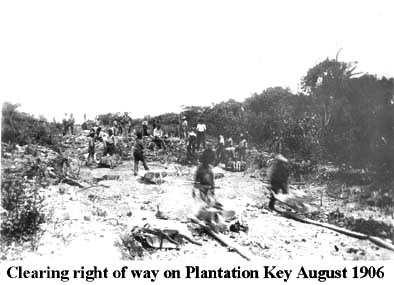 It is March of 1907 before rolling stock equipment reaches Plantation Key. Think of it, the track must be in place first. 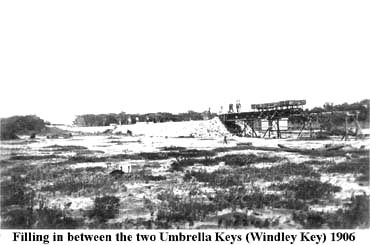 There was at least one large steam operated "skidding excavator" in use by March 1907. This excavator did not use railroad tracks. The above photo is included as I believe it is one of the most dynamic. It is truly worth 10,000 words. Only the year is identified, but it appears to be the fill between the two Umbrella Keys. See the last photo on this page. Above is a railbed about ready for the placement of wooden crossties to support the track. This should have been late 1906. 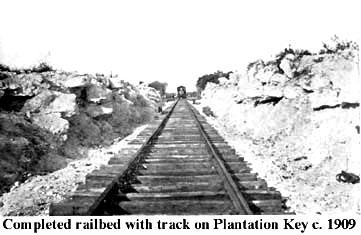 Before the final track for schedule rail service in 1908, the railbed had been packed by many construction train trips. Locomotive number 10 was a light engine, but hauled heavy loads at a very slow rate of travel. 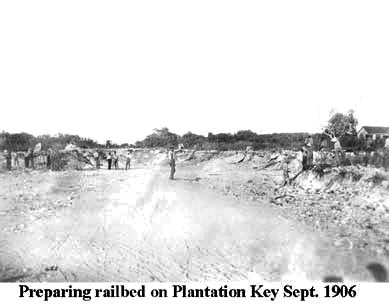 Above is shown the finished railbed with track for daily service from Miami to Knight's Key Dock. 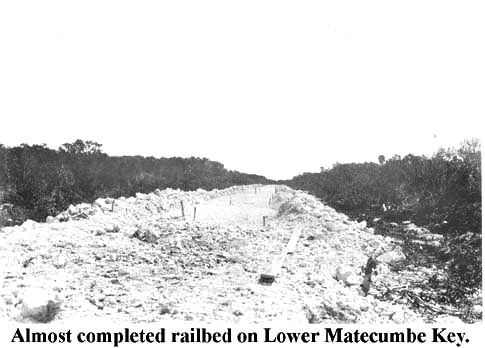 From 1908 to 1912 the railbed, bridges and track was being completed in the Lower Keys. Below is shown the usual method to fill low elevations. Engine no. 10 would push loaded "Baldwin" side-dump cars onto a wooden trestle. The rock was dumped to literally fill in around the wooden trestle. This, like Dove Creek on Key Largo, was a slough and would inundate with water at high water times. Lets move on and build some small fixed non concrete bridges. The above technique and dredges were used to build the approaches to the bridges after a concrete abutment was in place.